Chicago O’Hare International Airport, situated on the Far Northwest Side of Chicago, is the gateway to the Windy City. In 1994, the airport was renamed O’Hare International Airport to honour Edward O’Hare, the U.S. Navy’s first flying ace. O’Hare International Airport serves direct flights to 208 destinations, including domestic and international destinations. Chicago O’Hare International Airport (IATA code: ORD) is the third-busiest airport in the United States of America and the hub for American Airlines and United Airlines. Flights to Chicago O’Hare International Airport are provided by international airlines such as Turkish Airlines, Qatar Airways and Cathay Pacific Airways. ORD is a 20-minute drive from the city centre of Chicago. Book your cheap flights to and from Chicago O’Hare International Airport online! Chicago O’Hare International Airport is the primary airport serving the Chicago metropolitan area. There are 8 runways located at Chicago O’Hare International Airport, which is more than any other major international airport. Chicago O’Hare International Airport is an international gateway to the Midwest. It serves flights to Europe, Asia, South America and North America. Voted the “Best Airport in North America” for 10 years by two separate magazines, Chicago O’Hare International Airport proves its excellence by running efficient flights daily. Airport patrons are in for a treat at Chicago O’Hare International Airport, with a magnificent variety of food and drink options. There are fast food franchise outlets, restaurants, bars, salad bars, bakeries, a gourmet market, juice bars, and coffee shops located in the airport’s terminals. For some amazing retail therapy, patrons can explore the amazing range of shops at O’Hare International Airport. Discover world-class duty-free shopping, as well as sportswear, clothing, cosmetics, sunglasses, jewellery and souvenir stores. Chicago O’Hare international departures terminal has magnificent lounges for travellers on airlines such as Air France/KLM, Korean Air, Turkish Airlines and Emirates. Chicago O’Hare International Airport has a wide variety of facilities, including a health club, a spa, a yoga room, a barber shop, an on-site hotel, an aeroponic garden, banking, a medical centre and a chapel. O’Hare Inn & Suites offers convenient accommodation with excellent services. It is a 10-minute drive from Chicago O’Hare International Airport. Amenities include a business centre, a shuttle service and free Wi-Fi. This hotel offers excellent newly renovated accommodations and amenities. It is a 5-minute drive from Chicago O’Hare International Airport. Amenities include complimentary Wi-Fi, a gift shop, an indoor pool and a 24-hour airport shuttle. Enjoy a luxurious stay at the DoubleTree by Hilton with a freshly baked chocolate chip cookie on arrival. It is a 5-minute drive from Chicago O’Hare International Airport. Amenities include a complimentary airport shuttle, a steakhouse, coffee shop, a heated indoor pool and a fitness centre. Travellers can purchase their foreign exchange 60 days before departing Nigeria. Seaway National Bank can be found in the Main Hall of Terminal 2 and the Lower Level of Terminal 5 in Chicago O’Hare International Airport. There are several parking options available at Chicago O’Hare International Airport, including valet services, daily parking and long-term/economy parking. The airport has disabled parking available in all parking areas. For helpful parking information, email your questions and comments to parking@flychicago.com or call the Parking Garage Office at (773) 686-7530. Chicago O’Hare International Airport is 27 km northwest of Chicago Loop (central business district). 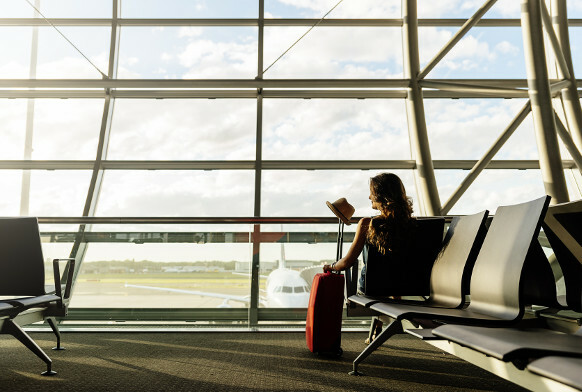 Airport shuttles, metered taxis, limousines, Uber, trains, buses and car hire options are available to transport you from the airport to your destination.